Jersey is blessed to be surrounded by beautiful sandy beaches. Our favourites are St Brelade’s Bay, St Ouen’s Bay and Greve de Lecq, all located in the west of the island and covered in fine yellow sand perfect for sandcastle building and beach games. The water is clean and clear, ideal for paddling in the shallows or playing in the waves. The east coast bays tend to be more rocky – ideal for exploring the small rockpools and gullies for weird and wonderful sea creatures such as wild fish, crabs, sea squirts, starfish and anemones. We recommend Archirondel, Anne Port, Green Island and La Rocque Harbour as perfect beaches to put your fishing net to work. The tidal range in Jersey is dramatic so be sure to check the tide times before venturing out. Jersey Zoo is without a doubt Jersey’s most famous and loved attraction. Experience some of the world’s most endangered species within the beautiful surroundings of the Park’s 32 acres of paths, manors, lawns, enclosures and lakes. Visit the 1,400 mammals, birds, reptiles and amphibians and over 130 endangered species including Sumatran orangutans and Madagascan lemurs. You can take a picnic to the park and enjoy the peace and quiet of the orchard, or stop for a bite to eat in the excellent Café Firefly. Dominating the east coast of Jersey, Mont Orgueil is a 800 year old fortification with a maze of staircases, towers and secret rooms. Children will love exploring the nooks and crannies and learning about the history of this imposing but magical place. Tamba Park opened in 2015 and was an instant hit with locals and visitors alike. The main feature is the tremendous Dino Trail, complete with animatronic dinosaurs to delight both young and old – be prepared to be wowed! Enjoy the trampolines or mini-golf, sail the lake on electric micro-boats and, when the adults need a break, let the kids loose in the adventure play zone. Ride the R.I.B to the offshore islands of Les Ecrehous or Les Minquiers, pop across to the small but perfectly formed Channel Island of Sark or go further afield for French family fun. Make sure you take your camera - dolphins and seals are regularly spotted on these trips! The National Trust for Jersey hosts a great range of events to keep your little ones entertained. Don your wellies on a woodland wander, splash around on a rock pool ramble, discover fresh water pond life with ‘Hop To It!’ or delight in creepy crawlies on a Bug Safari. Activities usually feature fun and educational games themed around the event. The three mile long sweep of St Ouen’s Bay is well-known as one of the best surfing spots in the British Isles. Pop in to see Nick and Karena at Laneez Surf School for a fun filled introduction to surfing or body boarding! With over 30 activities within the aMaizin' Adventure Park, there are hours of fun to be had for all the family, including those all important indoor activities for when the weather is less than perfect. Negotiate the maze with a scavenger hunt and a puzzle sheet, ride the toboggan or go-karts and visit the barnyard animals for a dose of cute furry animals! Jersey Joe's is an American-style diner within the Merton Hotel where you step back in time to enjoy 1950s milkshakes, ice-cream sundaes and jumbo hotdogs. 'The Splash' overlooks the wide expanse of St Ouen’s Bay with tables inside and out. They have an excellent kids' menu, a pool table and ample space for families. The Treehouse is family pub near the stunning St Brelade’s Bay with a spacious garden, a soft play area and great food including pizzas, pastas and burgers. Ransom's is open for breakfast, brunch, lunch and tea with a simple and fresh menu and many choices for both adults and children. Be sure to try the banoffee pie for dessert! 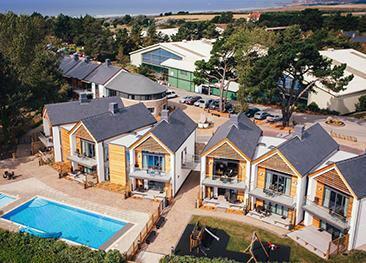 Les Ormes Holiday Resort is one of Jersey's premier self catering, activity and leisure venues.The complex is the ideal destination for fun-filled active holidays as well as relaxing breaks.